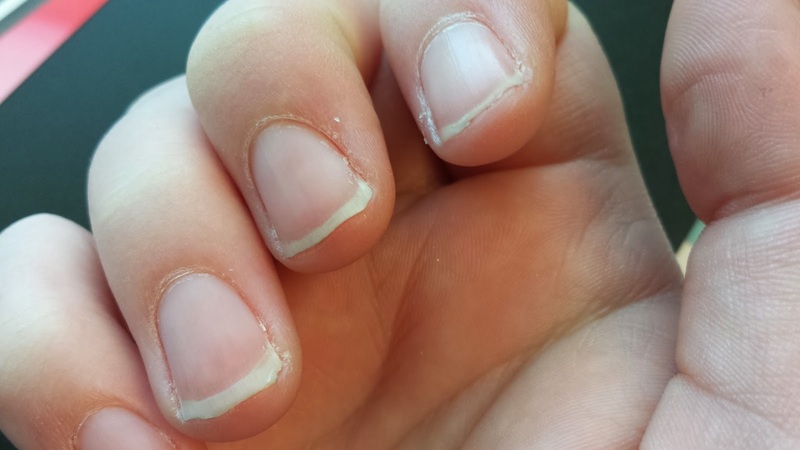 Near Normalcy: This is not a post about fingernails. This blog has not historically been a serious blog. It's probably not going to become one. But you know, I'm making some big changes in my life in 2014, and those changes are bound to be reflected here. Big changes! For one thing, um, I think maybe I'll try to blog every now and then. I have a spotty history with New Year's Resolutions. You may remember the ill-fated Xbox Kinect of 2012. Ahem. Truth be told, I generally just steer clear of the whole "resolution" thing. Goals are good, and I've always had goals. I've just never really placed emphasis on the beginning of the year as a time to make new ones. But this year, I'm at a natural transition point in my life that happens to coincide with the new year, so I'm going with it! First, my mother gave me one of these little books. It's called "Pick Four," and it's published by Seth Godin, based on the teachings of Zig Ziglar. So much great stuff between these two guys! I love Seth's blog (who doesn't? ), and have always respected Ziglar, though I have to admit I haven't listened to him as much as I'd like. I may be adding him to my commute soundtrack for awhile (the kids will love that!). At the core of the message was Zig's relentless positive attitude and his focus on written goals. I started writing down my goals, keeping track of daily effort, which led to daily progress which led to a dramatic shift in my working life. It's an incredible privilege for me to modernize this work and bring it out in this new form. But the essence is still the same: if you do the work, if you write it down, things will change. And faster than you expect. 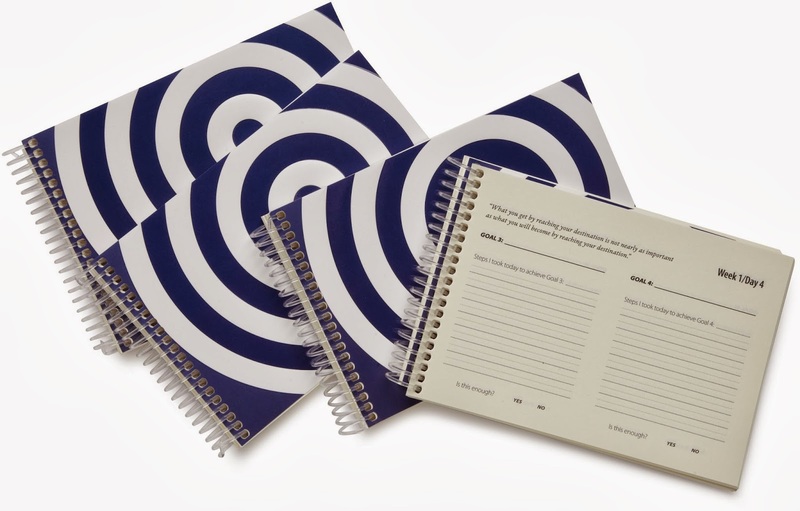 The booklet asks you to write down all your dreams and goals, anything and everything, no matter how big or small. I took this pretty seriously. "Write a best-selling novel" is there, and "work for my dream company" (the list includes Lullabot and Buffer, if you're curious--tech companies and startups known for their commitment to transparency and company culture, and for their distributed team structure). "Raise children who joyfully serve God and others" is on the list. So is "have beautiful nails." Hey, shut up. These are my dreams. These are my actual fingernails. It's a long road ahead. Next, you're supposed to whittle those down, and eventually arrive at 4 immediate goals. Not 5. Not 3. "Pick Four." Surprisingly, "have beautiful nails" didn't make the cut. This time. These are my immediate, short-term, actionable goals, and for the next 12 weeks, they will be my top priorities. 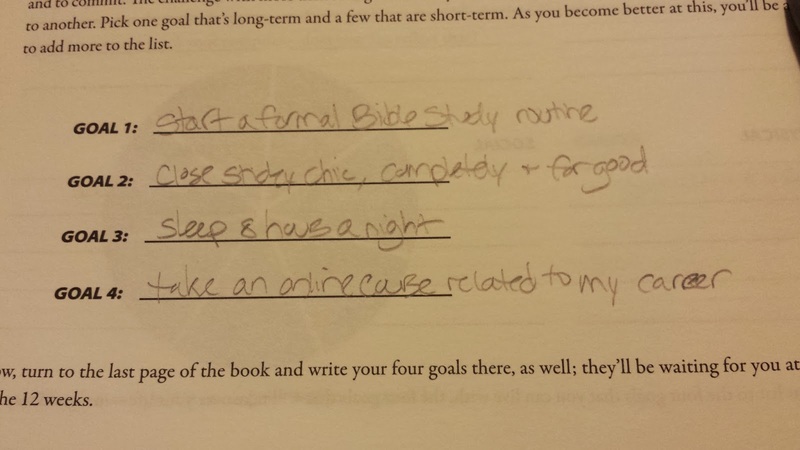 Some of them, like Bible study and a full night of sleep, are habits I hope to set and maintain for a lifetime. Others, like closing Sticky Chic (which means closing out each and every open order with a satisfied customer, paying off all bills and debts, and liquidating the inventory I don't plan to keep) are do-it-and-be-done goals. And the fourth goal, taking an online course, is really a subset of larger, long-term goals, including a general commitment to lifelong learning, and the goal to advance my career and move into a company I'm passionate about working for. To help me focus and stay motivated, I'm using Lift, an app I just discovered. I haven't quite figured it all out yet, but so far I enjoy having a place to go check off a checkbox, and I like the way it focuses on incremental progress. It also tracks streaks, and will send you reminders throughout the day if you choose. I have it remind me to sit up straight. ;) I made my mom sign up, too, so we can cheer each other on. Further, I've been doing lots of reading, because that's how I roll, and specifically I've been reading about goals and productivity. This article by James Clear really hit home for me: "Commit to a process, not a goal." You should go over there right now and read it. Seriously. (If you liked that, read this one too.) It makes so much sense, and is so inspiring. It's also, at its heart, a fancy way to preach that old 12-step standard: One Day At A Time. So in 2014, I'm taking it one day at a time. I'm focusing on the process. I'm setting priorities each morning and I'm making progress each day. What are your goals for the new year? Any tips for making progress on mine? And seriously, how do I get my nails to stop breaking? !